What’s The Big Deal About Clean Air? Compressed air isn’t called manufacturing’s “Fourth Utility” (the first three being electricity, water, and natural gas) for nothing. Pneumatic tools are popular because they’re often so much lighter than their electric counterparts. Compressed air can be stored in receiver tanks for use when other power supplies are unavailable or not feasible. Many compressed air operated products can be made to withstand environmental factors (high/low temperature, corrosive elements, atmospheric dust, oil, other contaminants, etc.,) that would make electric devices very expensive, unwieldy, or impractical. One of the most valuable considerations, though, is that your compressed air system is, by and large, under your control. The type and capacity of your air compressor can be determined by your specific operational needs. The header pressure in your supply lines is based on the applications that your air-operated devices are used for. And the performance & lifespan of every single component in your compressed air system is determined by the care you take in maintaining it. Debris: solid particulates can enter your air system through the compressor intake, during maintenance, or if lines are undone and remade. If you have moisture in your air (more on that in a minute,) that can promote corrosion inside your pipes, and rust can flake off in there. Almost all of your air operated products have moving parts, tight passages, or both…debris is just plain bad for them. And if you use air for blow off (cleaning, drying, etc.,) keep in mind that anything in your compressed air system will almost certainly get on your product. Your compressed air system may be equipped with a main filter at the compressor discharge. This is fine, but since there is indeed potential for downstream ingress (as mentioned above,) point-of-use filtration is good engineering practice. EXAIR recommends particulate filtration to 5 microns for most of our products. Water: moisture is almost always a product of condensation, but it can also be introduced through faulty maintenance, or by failure of the compressor’s drying or cooling systems. Any way it happens, it’s also easy to combat with point-of-use filtration. EXAIR includes an Automatic Drain Filter Separator in our product kits to address both of these concerns. A particulate filter element traps solids, and a centrifugal element “spins” any moisture out, collecting it in the bowl, which is periodically drained (automatically, as the name implies) by a float. Point of use filtration is key to the performance of your compressed air products, and their effectiveness. Regardless of your application, EXAIR has Filter Separators to meet most any need. Oil: many pneumatic tools require oil for proper operation, so, instead of removing it, there’s going to be a dedicated lubricator, putting oil in the air on purpose. Optimally, this will be as close to the tool as possible, because not all of your compressed air loads need oil…especially your blow offs. If, however, a blow off device is installed downstream of a lubricator (perhaps due to convenience or necessity,) you’ll want to do something about that oil. Remember, anything in your system will get blown onto your product. If this is the case, or you just want to have the cleanest air possible (keep in mind there is no downside to that,) consider an EXAIR Oil Removal Filter. They come in a range of capacities, up to 310 SCFM (8,773 SLPM,) and the coalescing element also offers additional particulate filtration to 0.03 microns. If you’d like to discuss or debate (spoiler alert: I’ll win) the importance of clean air, and how EXAIR can help, give me a call. Compressed air filters help to keep the air clean and condensate free to protect equipment from dust, dirt, pipe scale, oil and water. Even though the compressed air system will typically have a main dryer, additional treatment is often necessary. For this discussion, we will focus on the oil removal process and filter type. After the compressed air has passed through a particulate filter, the dirt, dust and water droplets have been removed. Oil that is present is much smaller in size, and mostly passes though the particulate filter. The installation of a coalescing filter will provide for the removal of the majority of the fine oil aerosols that remain. The coalescing filter works differently than the particulate filters. The compressed air flows from inside to outside through the coalescing filter media. The term ‘coalesce’ means to ‘come together’ or ‘form one mass.’ The process of coalescing filtration is a continuous process where the small aerosols of oil come in contact with fibers of the filter media. As other aerosols are collected, they will join up and ‘come together’ and grow to become an oil droplet, on the downstream or outside surface of the media. Gravity will then cause the droplet to drain away and fall off the filter element. Oil free compressors do not provide oil free air, as the atmospheric air drawn in for compression contains oil vapors that will cool and condense in the compressed air system. If you would like to talk about oil removal filters or any of the EXAIR Intelligent Compressed Air® Products, feel free to contact EXAIR and myself or one of our Application Engineers can help you determine the best solution. What Makes A Compressed Air System “Complete”? It’s a good question. When do you know that your compressed air system is complete? And, really, when do you know, with confidence, that it is ready for use? A typical compressed air system. Image courtesy of Compressed Air Challenge. Any compressed air system has the basic components shown above. A compressed air source, a receiver, dryer, filter, and end points of use. But, what do all these terms mean? A compressor or compressed air source, is just as it sounds. It is the device which supplies air (or another gas) at an increased pressure. This increase in pressure is accomplished through a reduction in volume, and this conversion is achieved through compressing the air. So, the compressor, well, compresses (the air). A control receiver (wet receiver) is the storage vessel or tank placed immediately after the compressor. This tank is referred to as a “wet” receiver because the air has not yet been dried, thus it is “wet”. This tank helps to cool the compressed air by having a large surface area, and reduces pulsations in the compressed air flow which occur naturally. The dryer, like the compressor, is just as the name implies. This device dries the compressed air, removing liquid from the compressed air system. Prior to this device the air is full of moisture which can damage downstream components and devices. After drying, the air is almost ready for use. To be truly ready for use, the compressed air must also be clean. Dirt and particulates must be removed from the compressed air so that they do not cause damage to the system and the devices which connect to the system. This task is accomplished through the filter, after which the system is almost ready for use. To really be ready for use, the system must have a continuous system pressure and flow. End-use devices are specified to perform with a required compressed air supply, and when this supply is compromised, performance is as well. This is where the dry receiver comes into play. The dry receiver is provides pneumatic capacitance for the system, alleviating pressure changes with varying demand loads. The dry receiver helps to maintain constant pressure and flow. In addition to this, the diagram above shows an optional device – a pressure/flow control valve. A flow control valve will regulate the volume (flow) of compressed air in a system in response to changes in flow (or pressure). These devices further stabilize the compressed air system, providing increased reliability in the supply of compressed air for end user devices. Now, at long last, the system is ready for use. But, what will it do? What are the points of use? Points of use in a compressed air system are referred to by their end use. These are the components around which the entire system is built. This can be a pneumatic drill, an impact wrench, a blow off nozzle, a pneumatic pump, or any other device which requires compressed air to operate. If your end use devices are for coating, cleaning, cooling, conveying or static elimination, EXAIR Application Engineers can help with engineered solutions to maximize the efficiency and use of your compressed air. After placing so much effort into creating a proper system, having engineered solutions is a must. A large manufacturing company called looking for a better solution to control the thickness of a curing agent being applied to the outside of tubing used in the automotive industry. The tubing is formed in an extruder and travels through a liquid cooling chamber and then air dried. After the tubing is dried, it is sent to a spray chamber where the curing agent is applied to the exterior. On the exit side of the spray chamber, the customer had installed several flexible air lines placed around the perimeter of the tubing to blow air across the surface to help control the coating thickness. This worked somewhat but they were seeing an increase in the amount of rejected material as the air pattern was sporadic and uneven, which caused streaking and dry spots in certain areas of the tubing. They reviewed our web site and familiarized themselves with our Air Wipes but were unsure of the best design and size to fit their need so they reached out for assistance. After further discussing the process, their tube O.D. sizes range from 3/8″ – 1/2″, making our 1″ Air Wipe the ideal solution. As far as the design, the Standard or Super Air Wipe, I recommended they use our Model # 2451 Super Air Wipe kit due to the aluminum construction and stainless steel wired braided hoses being able to withstand the potential temperature in the area of 200°F. The kit includes a filter separator to remove any water or contaminants in the supply and a pressure regulator which would allow them to control the flow and force of the exiting air, to help “dial” it in to fit the demand of the application. Super Air Wipe is available in sizes from 1/2″ up to 11″ in Aluminum construction and up to 4″ in Stainless Steel construction. EXAIR Air Wipes features a split design, which can easily be clamped around the material, to provide a 360° uniform airflow, perfect for treating the surface of round shapes, like extruded tubing. If you have an application where you are needing to dry, cool or clean the outside of a pipe, hose or cable, contact an application engineer for help making the best product selection. Compressed air systems will contain contaminants that can lead to issues and increased costs through contamination of product, damage to the air operated devices, and air line clogging and restriction. Proper air preparation is critical to optimizing performance throughout the plant operations. Because there are different types of contaminants, including solid particles, liquid water, and vapors of water and oil, there are different methods of filtration, each best suited for maximum efficiency in contaminant removal. Particulate Filters – The compressed air flows from outside to inside of the filter element. The compressed air first passes through a baffle arrangement which causes centrifugal separation of the largest particles and liquid drops (but not liquid vapors), and then the air passes through the filter element. The filter element is usually a sintered material such as bronze. The filter elements are inexpensive and easy to replace. Filtration down to 40-5 micron is possible. Coalescing Filters – This type operates differently from the particulate type. The compressed air flows from inside to outside through a coalescing media. The very fine water and oil aerosols come into contact with fibers in the filter media, and as they collect, they coalesce (combine) to form larger droplets towards the outside of the filter element. When the droplet size is enough the drops fall off and collect at the bottom of the filter housing. The filter element is typically made up of some type glass fibers. The coalescing filter elements are also relatively inexpensive and easy to replace. Filtration down to 0.01 micron at 99.999% efficiency is possible. Adsorption Filters – In this type of filtration, activated carbon is typically used, and the finest oil vapors, hydrocarbon residues, and odors can be be removed. The mechanism of filtration is that the molecules of the gas or liquid adhere to the surface of the activated carbon. This is usually the final stage of filtration, and is only required for certain applications where the product would be affected such as blow molding or food processing. When you work with us in selecting an EXAIR product, such as a Super Air Knife, Super Air Amplifier, or Vortex Tube, your application engineer can recommend the appropriate type of filtration needed to keep the EXAIR product operating at maximum efficiency with minimal disruption due to contaminant build up and unnecessary cleaning. If you have questions regarding compressed air filtration or any EXAIR Intelligent Compressed Air® Product, feel free to contact EXAIR and myself or one of our Application Engineers can help you determine the best solution. Many times in the stories that are written in our daily blogs, we espouse the many benefits of installing and using EXAIR made products into our many customers’ compressed air-based applications. From the guy who has a small shop in his home garage using our Atto Super Air Nozzle to much larger applications where customers use our 84” Long Super Air Knives to do such things as drying cast Acrylic Sheets used in tub and shower surrounds, the message is a very consistent one. Customers benefit by saving money, increasing the safety level of an application, reducing sound levels and improving productivity. There’s no doubt that our customers will excel in these areas. Knowing there is much more to a compressed air system than just point of use products, lets shed a little light on the other “parts” of a typical system set-up. Those would be the compressed air filter / separators and the pressure regulators that are a highly recommended part of a good installation. But why are they so highly recommended? What exactly is their role and why would anyone want or need to install them? First, the blunt realities of compressed air and its relative “un-clean” condition once it arrives at the point of use. Since compressed air a utility that is produced in-house, the quality and quantity available will vary widely from facility to facility. And since it is not a regulated utility such as gas or electricity are, there are no universal minimums of quality that compressed air must meet before sent out to the distribution system. Yes, of course, companies are all the time getting better at this part, but many still operate with older, iron pipe systems that produce rust and scale which wreak havoc on the components within mechanical products that use compressed air as their power source. The point is that you are never sure of the quality of the air you will get at the point of use, so install a compressed air filter near that point to keep the debris out of your Air Knife, Nozzle, Line Vac or even other components like solenoid valves, air motors and the like. Believe me when I say it is much easier to un-screw a bowl from a filter housing and change an element than it is to disassemble an air motor or an 84” long Super Air Knife because rust migrated in from the pipes. So it is quite safe to say that an ounce of prevention in this case is worth a pound of cure! Second, the discussion turns to the Regulator part of the equation. As many know, our products and those of other pneumatic product manufacturers have a certain set of specifications regarding performance at stated input pressures. But what if your application doesn’t require that “full, rated performance”? Maybe instead of needing two pounds of force, you only need one pound? In fact, if you provided two pounds of blowing force, you would end up “over-blowing” your target. By that, I mean you cause damage to the target or other surrounding items in the application. Or, perhaps blowing to hard (or sucking too hard in the case of a Line Vac or E-vac) might cause the vessel or the material you are picking up to collapse or deform (due to too much power). There is also the concern about using more energy than one really needs to in order to achieve the desired effect in an application. In other words, if you can achieve your goals with only 40 PSIG, then why would you ever use 80 PSIG to accomplish the goal? By reducing your compressed air from 80 down to 40 PSIG, you can easily reduce the air consumption of the “engineered” solution by another 40% + …………that’s the cherry on top of the cake when you compare the benefits of simply “bolting on” the solution of an engineered air nozzle vs. an open pipe in the first place. Then there is the issue of taking advantage of the pressure differential (from 80 down to 40 PSIG) that creates a little bit more air volume capacity. At 80 PSIG, your compressed air to free air volume ratio is 6.4:1. At 40 PSIG, it is only 3.7:1. The net effect is you effectively have an overall larger volume of air at the disposal of the application which is always a good thing. 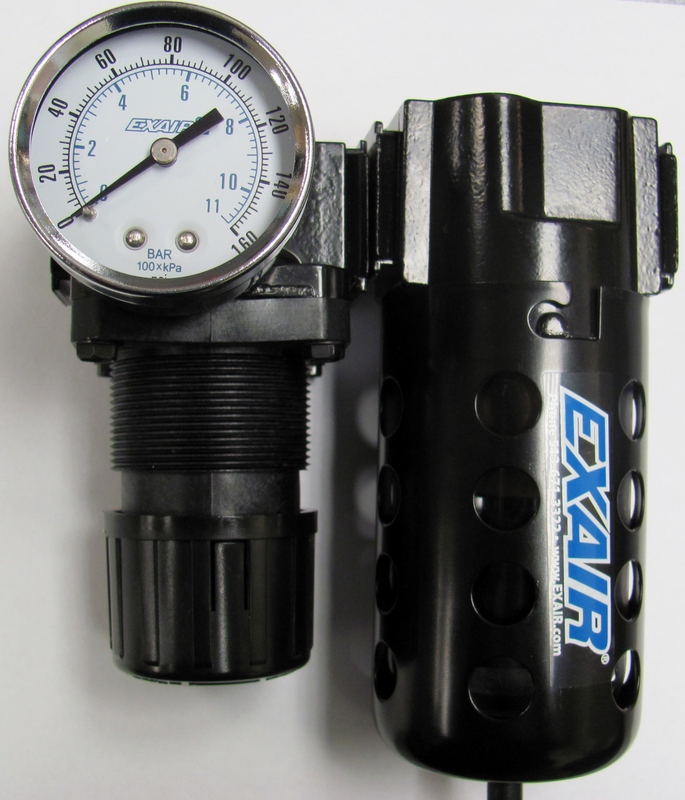 Regulating pressure is definitely warranted given the benefits that compliment the operation of the core EXAIR products. If you need a deeper understanding about how EXAIR’s products can help your application, feel free to contact us and we will do our best to give you a clear understanding of all the benefits that can be had by our products’ use as well as proper implementation of accessory items such as compressed air filters and regulators.